MANILA – The mothers of the two missing University of the Philippines students were appalled over the delay in the hearing of the case against retired Maj. Jovito Palparan, which was postponed on Aug. 17, and reset on Sept. 16. The month-long delay came after the case was transferred to another sala, following the decision of Judge Teodora Gonzales of Bulacan Regional Trial Court Branch 14 to inhibit from the case, in response to allegation of “partiality” by a lawyer of Palparan’s co-accused. The case was raffled to the next-door Bulacan regional trial court Branch 15, but it turned out that its judge, Alexander Tamayo is on leave. “Is this on purpose? Are they really trying to delay the case until ‘berdugong’ Palparan and his co-accused are free from accountability? 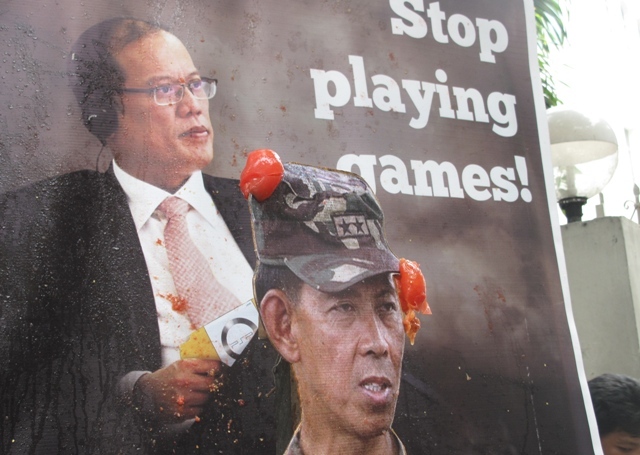 Is there an agreement between them and the military?” Concepcion Empeno told Bulatlat.com. Palparan and two others, Army Col. Felipe Anotado and Staff Sgt. Edgardo Osorio, face kidnapping and serious illegal detention charges over the enforced disappearance of Sherlyn Cadapan and Karen Empeño, who were abducted along with farmer Manuel Merino more than nine years ago. Sherlyn Cadapan’s mother, Erlinda, said the delay is “a mockery” of the human rights victims and witnesses who have shown courage, despite the heavy presence of soldiers who accompanied Palparan in court every hearing. The prosecution was supposed to present its last witness before Branch 14 on Palparan’s bail hearing. “Who is really in charge here? The mothers are baffled, if not aghast with this turn of events, even as they will endure all these travails to seek justice for their daughters and many others who were snatched in the dead of the night,” said a joint statement of the family’s lawyers, Edre Olalia and Julian Oliva Jr. of the National Union of Peoples’ Lawyers. Oliva said in a text message that Branch 14 did not set a hearing on the motion they filed against Gonzales’ inhibition. The judge was already on leave when he went to the Bulacan court yesterday, Aug. 17.